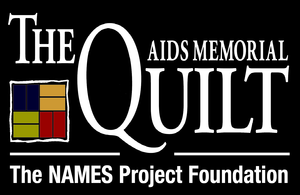 The goal of the quilt is to bring awareness to the AIDS pandemic and to provide support and healing to those affected by it. While advances have been made in the treatment and of prevention of HIV and AIDS, it remains a public health concern, which requires us to be vigilant as a community. 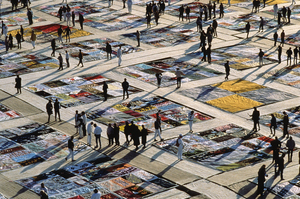 The idea for the NAMES Project AIDS Memorial Quilt was conceived in 1985 by activist Cleve Jones in San Francisco. During a candlelight march, he had people write the names of loved ones lost to AIDS-related causes on signs that were taped to the San Francisco Federal Building. 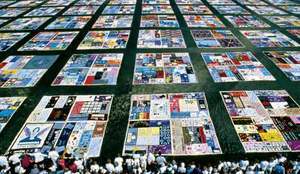 Realizing that those signs resembled a patchwork quilt, Jones and a group of volunteers were inspired to create an actual quilt of individual panels created by people to remember and celebrate the lives of loved ones lost to AIDS. Since a quilt is a symbol of American warmth and family, using a quilt at a time when people living with HIV and AIDS experienced family rejection, it became a symbol of the chosen family caring for those dying when their blood families abandoned them. Each individual panel is 3 feet by 6 feet- the size of an average grave. Each block contains 8 individual panels. The entire quilt was originally displayed on the National Mall in Washington DC in 1987. It covered an area larger than a football field and included 1920 panels. Today the entire quilt consists of more than 48,000 individual memorial panels.